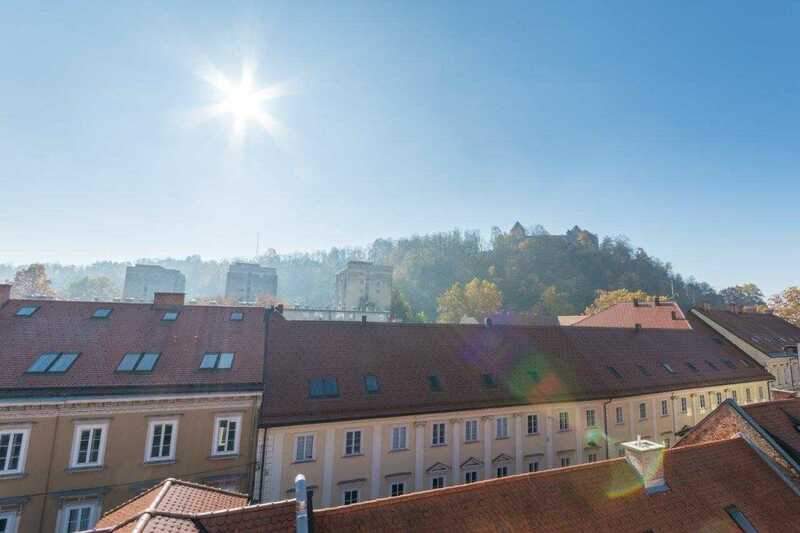 Live large in Ljubljana by staying in one of the most luxurious vacation apartments in the city with a huge terrace offering superb views of Ljubljana Castle and the Old Town rooftops. 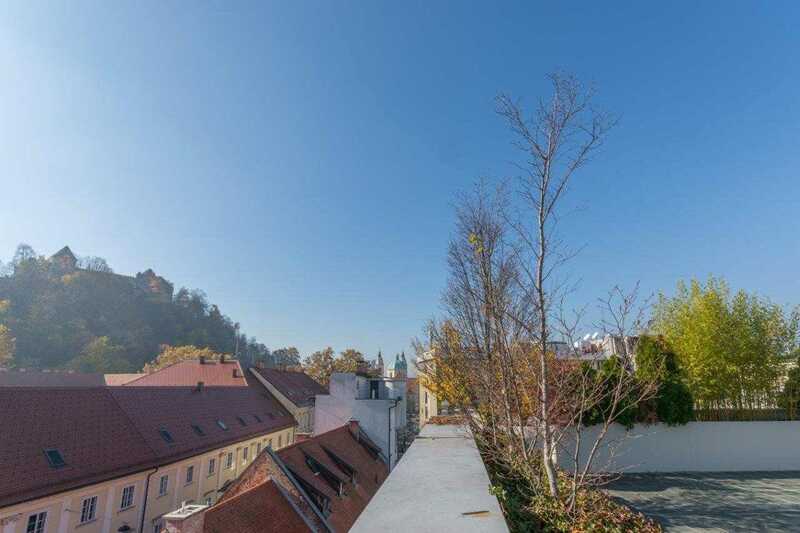 Our Ljubljana penthouse has a top location in the very center of Ljubljana with a private parking garage and elevator that takes you right up to the apartment. In addition, there’s air conditioning throughout, a cozy fireplace for the colder winter months, two bathrooms, and three bedrooms. The master bedroom has access to the master bathroom with Jacuzzi bathtub, to the walk-in closet and there’s a private terraceoff the master bedroom too. If you’re looking for a place to stay in Ljubljana that’s a cut above the rest, our luxury penthouse apartment certainly fits the bill. 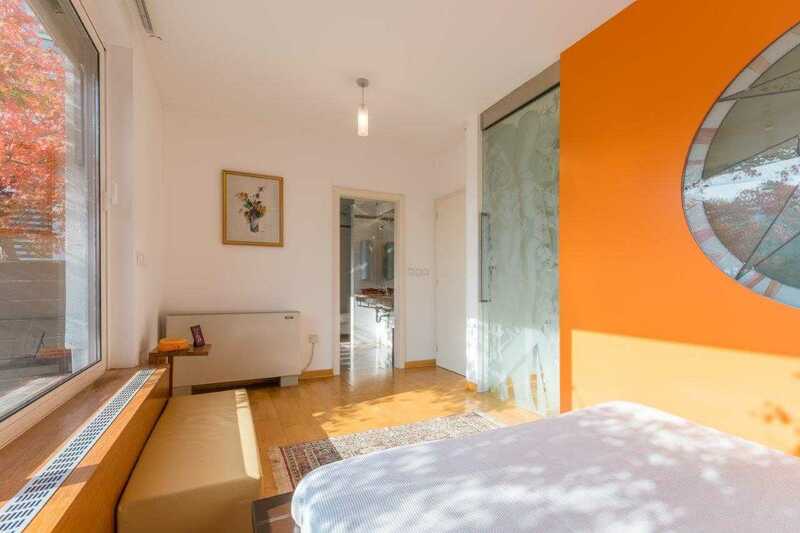 This is no ordinary vacation rental – the uxurious features, open plan living and enormous rooftop terrace will provide a truly memorable stay in Ljubljana, whatever time of the year you’re planning to visit. As you enter into our Ljubljana penthouse you’ll immediately get a sense for the high-end finishes. It’s bright and welcoming, even down to the choice of artwork on the wall. 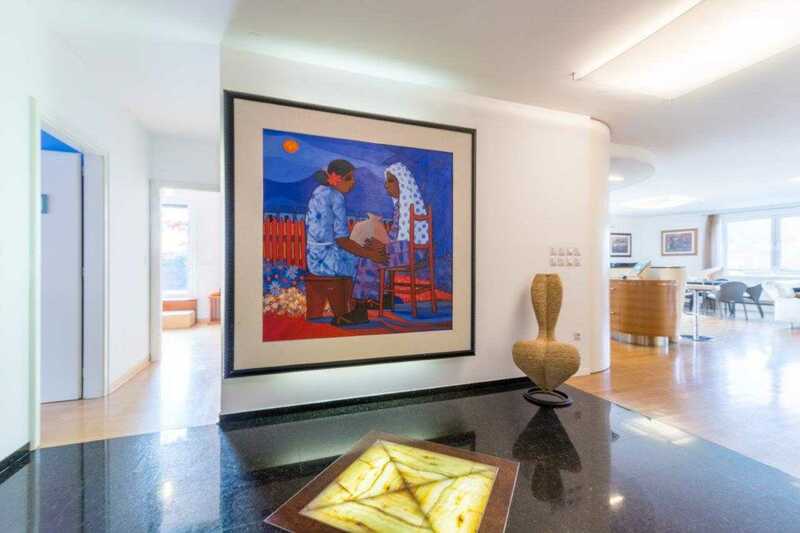 The painting is La Visita (The Visitor) and was painted by a well-known Central American artist, Candido Bido. It tells the story of a women visiting a friend in the countryside and bringing a present with her. Our hope is that this apartment will make you feel so welcome that you’ll forget you’re a visitor here. 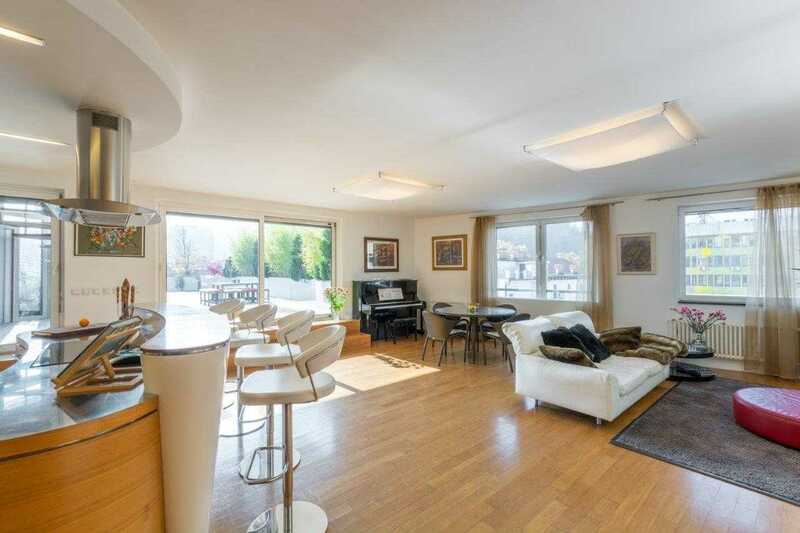 The spacious open concept living area gives the apartment the feel of a New York loft, except you’ll enjoy views of Ljubljana Castle, not the Manhattan skyline! 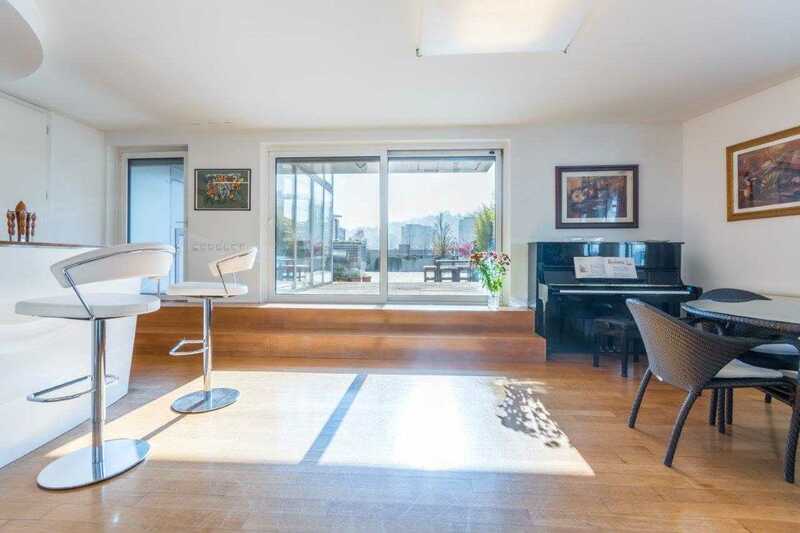 With windows and doors facing to the south and west this really is a bright apartment that benefits from natural sunlight throughout the day. 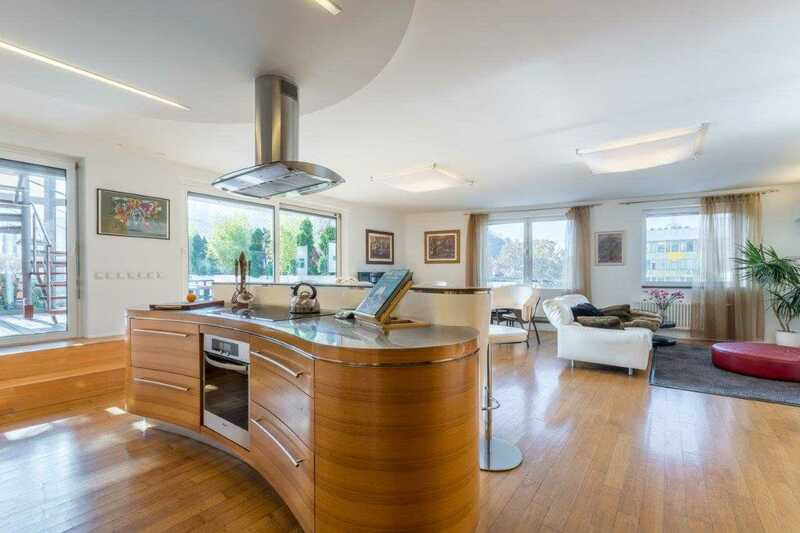 The kitchen is one of the spaces in this Ljubljana luxury apartment that really shows off its high end finishes. 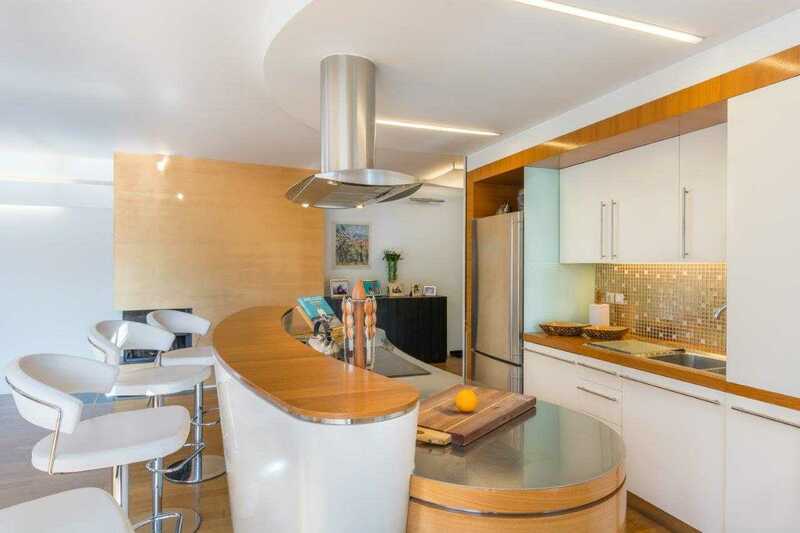 From the sleek curved kitchen island with bar stools and inset cooking stove, to the oversized stainless steel fridge and freezer. 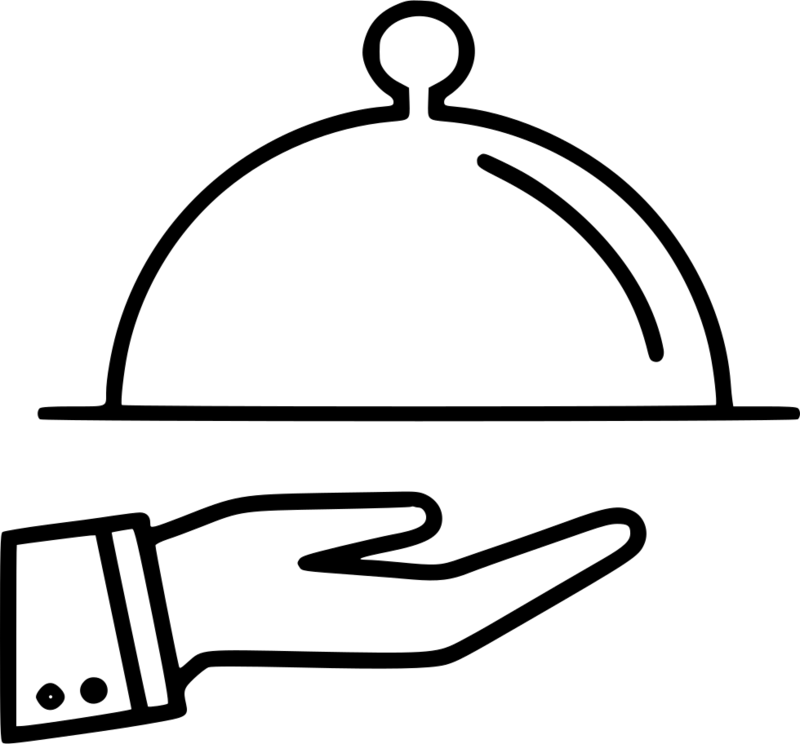 The kitchen comes fully equipped with everything you’ll need including a dishwasher and high quality pots, pans and crockery. 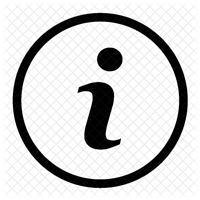 Although the apartment is open concept there are still clearly defined areas. One corner is set aside for lounging with its comfortable sofa and lounge chair providing great views of the plasma TV (which also has a blue-ray, DVD player and sound system). 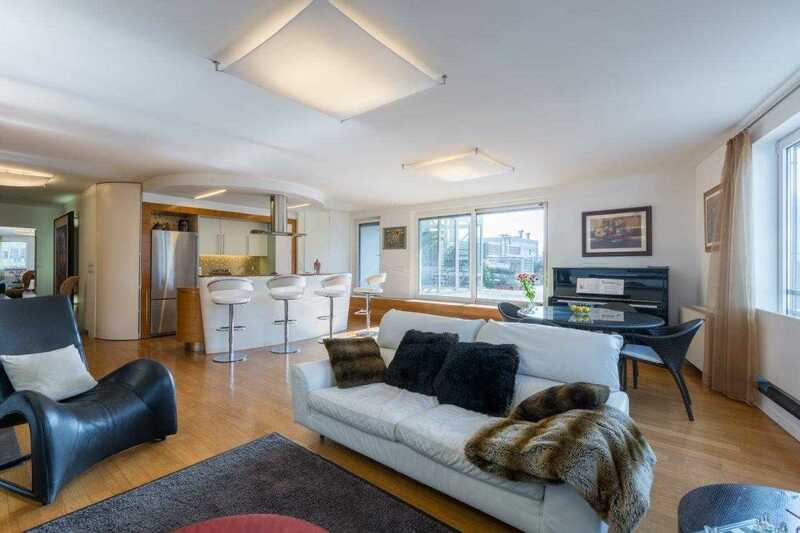 There is high end furniture including the sofa and the bar stools which are all leather. The dining room table can seat six. 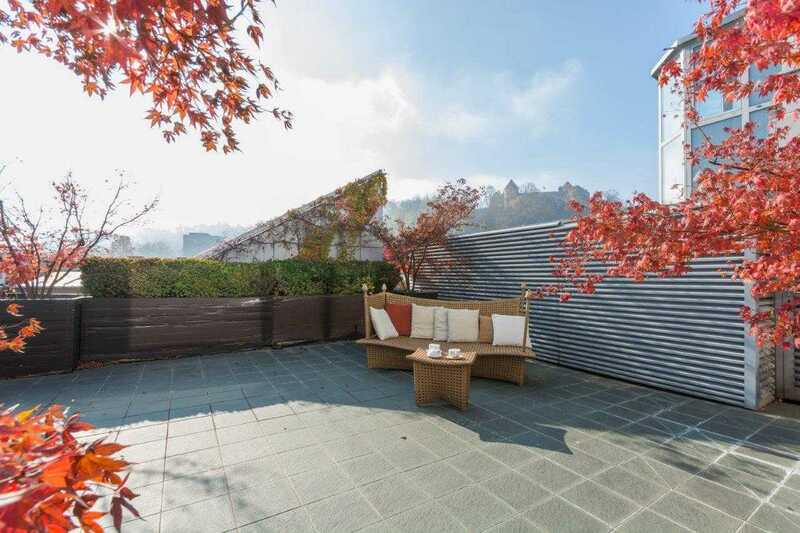 The inside of our Ljubljana penthouse is very special but when you add in this amazing rooftop terrace you begin to really appreciate what a magical vacation rental this is. The terrace is huge (130 sq meters) and in the summer months it is fully furnished with plenty of lounge chairs and even a table so you can dine al fresco while enjoying the wonderful views. The view that will most catch your eye is that of Ljubljana Castle as there’s a direct view of it from here. During the summer the terrace features plenty of greenery thanks to the large planting boxes with trees and shrubs in them and while it’s not as green during the winter those lovely Castle views are even clearer as the trees drop their leaves and reveal more of the castle’s walls and windows. On New Year’s Eve this is definitely the best place to be in Ljubljana because at midnight the impressive fireworks display is set off right from the castle. Bring your drinks out to the terrace and sing Auld Lang Syne! The Master Bedroom provides an oasis of calm and is such a private space. Modern furnishings and hardwood floors give the room a contemporary feel while the large windows let in plenty of light. 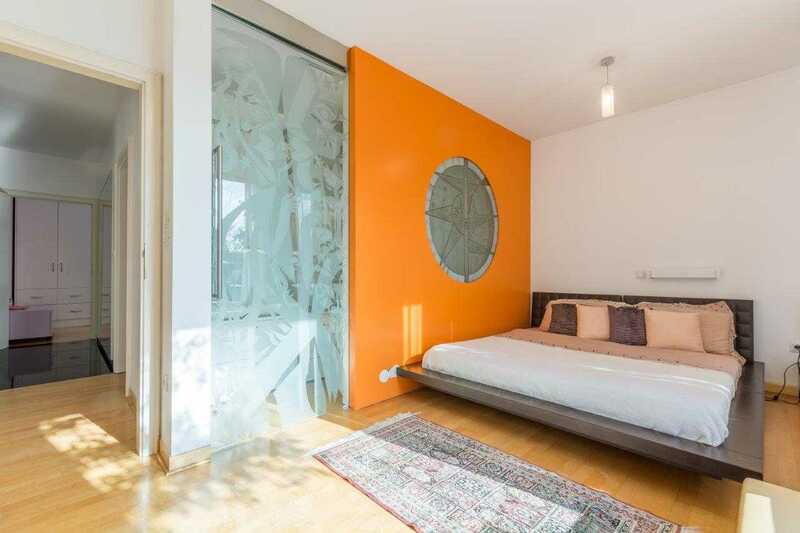 A special treat for anyone staying in this room is the door out to a private terrace. 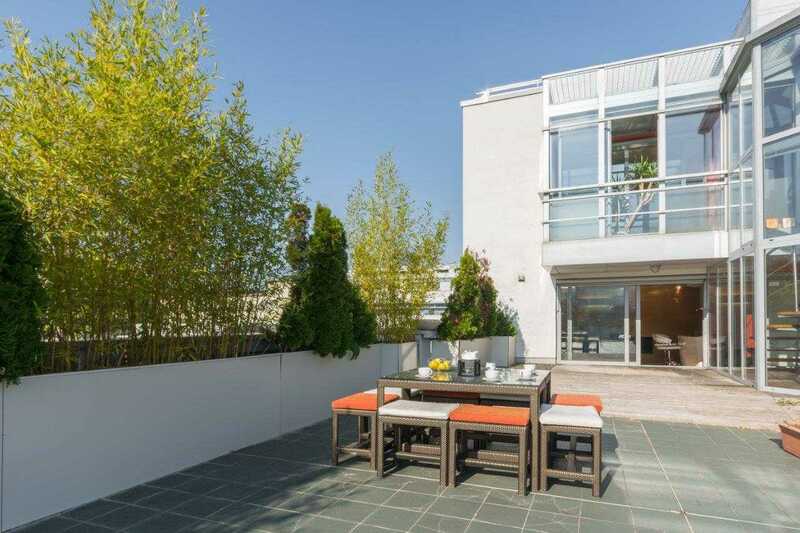 Unlike the main terrace this one can only be accessed through the master bedroom and provides a lovely private space to sit and sip on your morning tea or coffee. Bedroom two would be ideal for kids with its comfy day bed, plus the pull out trundle bed means this room can sleep two children or adults. The same can be said for the bed and trundle bed in bedroom three. 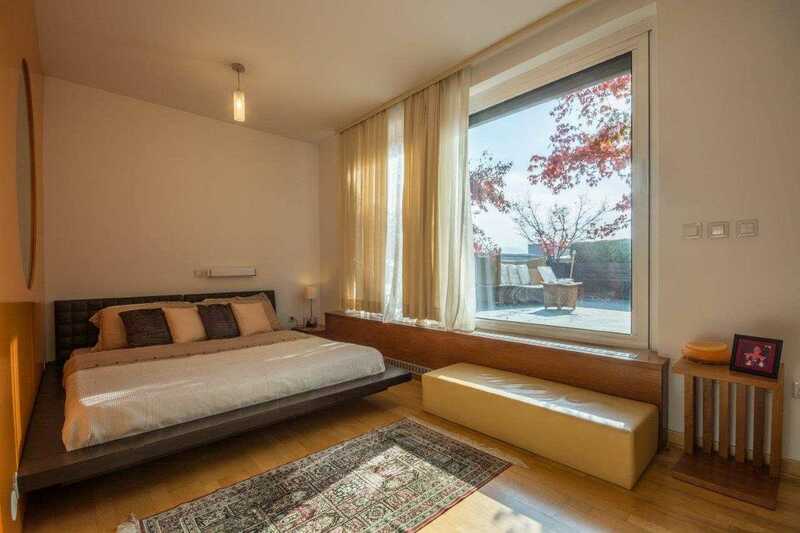 Both bedrooms have a desk and enough storage for clothes and other belongings, and there are blackout blinds at the windows to guarantee a good night’s sleep. 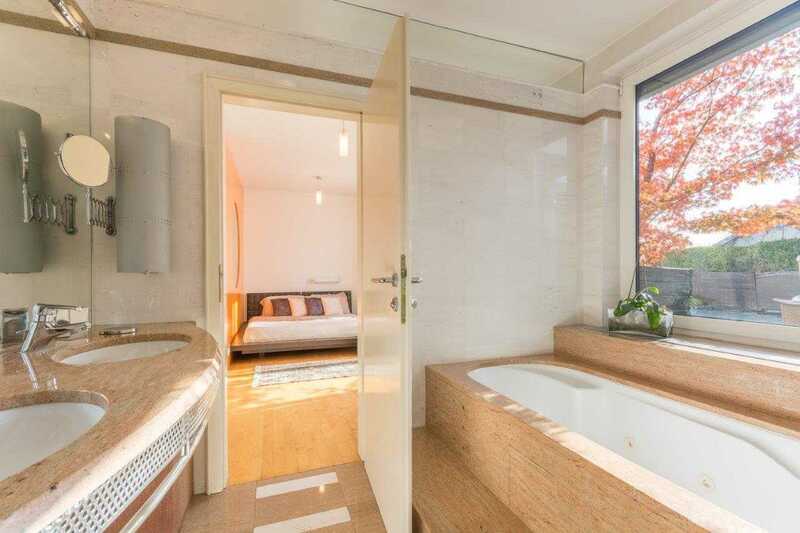 The family bathroom is shared between bedrooms 2 and 3. 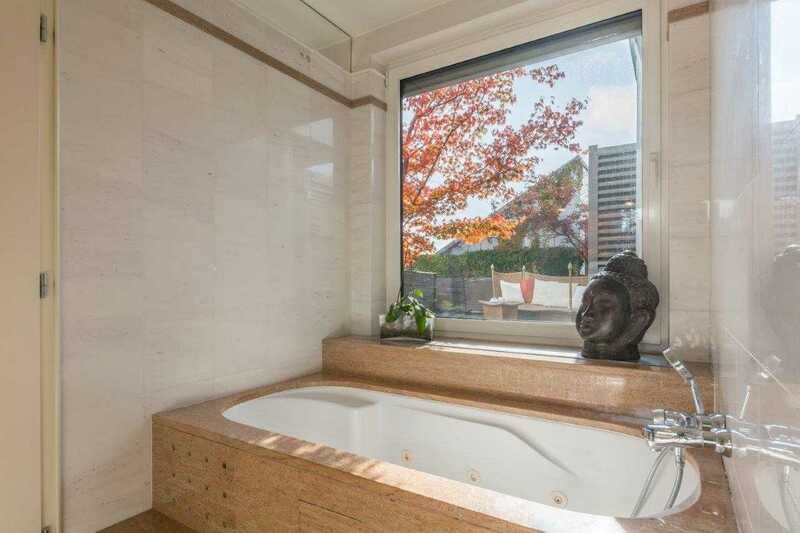 It has a walk-in shower though no bathtub. A heated towel ladder provides a place to hang your towels. 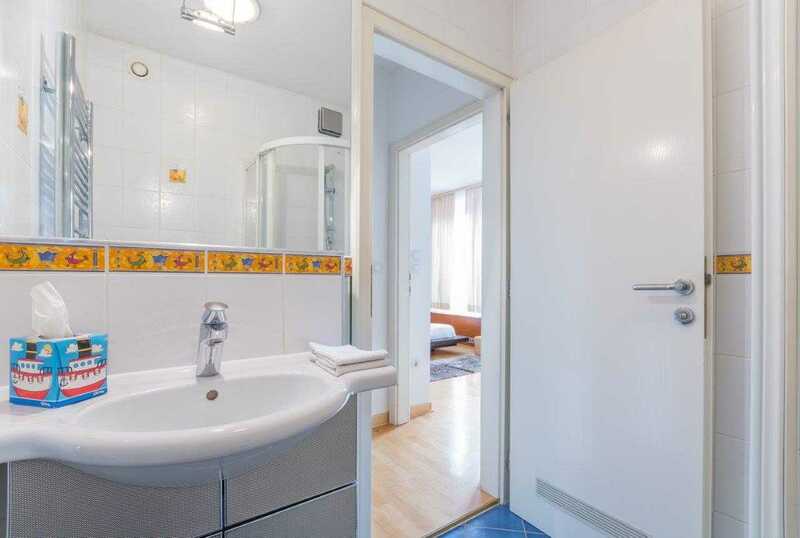 The apartment also has a very useful utility room where you’ll find a washing machine and dryer, perfect for anyone having a longer stay in this Ljubljana luxury apartment. 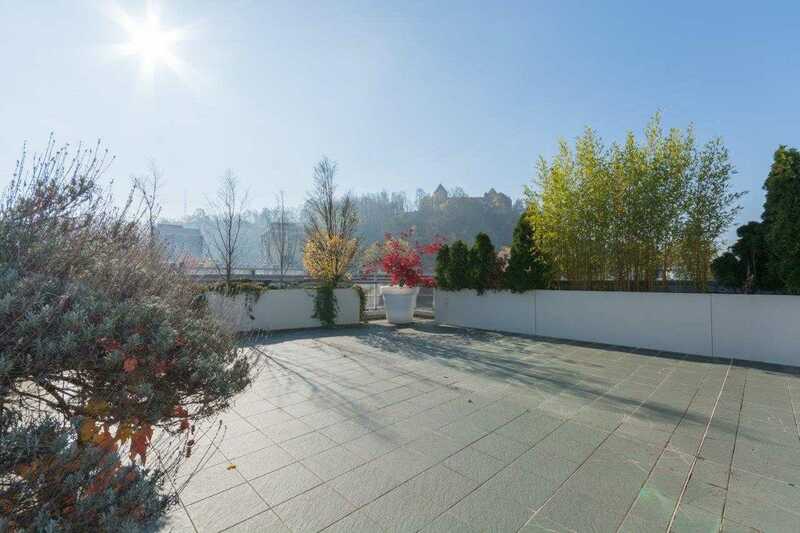 Check Availability and Book Your Stay in Our Luxury Ljubljana Penthouse Now! 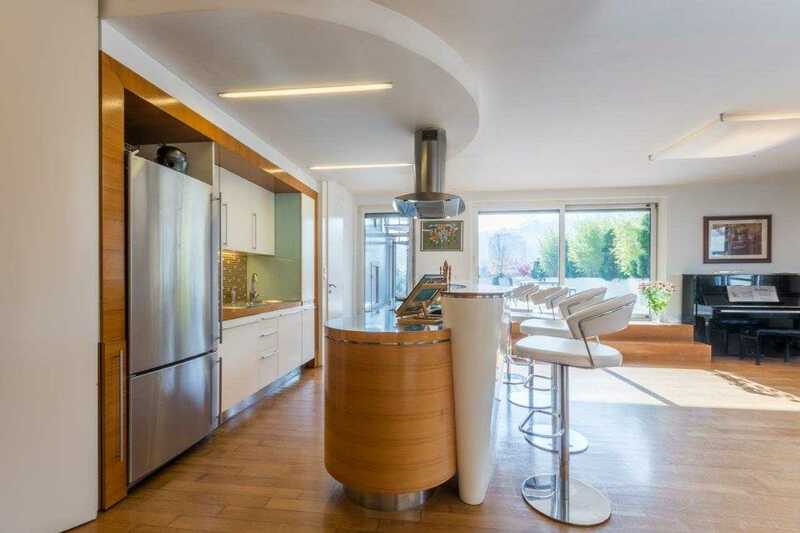 With so many great features to boast about this 3-bedroom Ljubljana penthouse is always a popular choice with families and friends visiting the city. 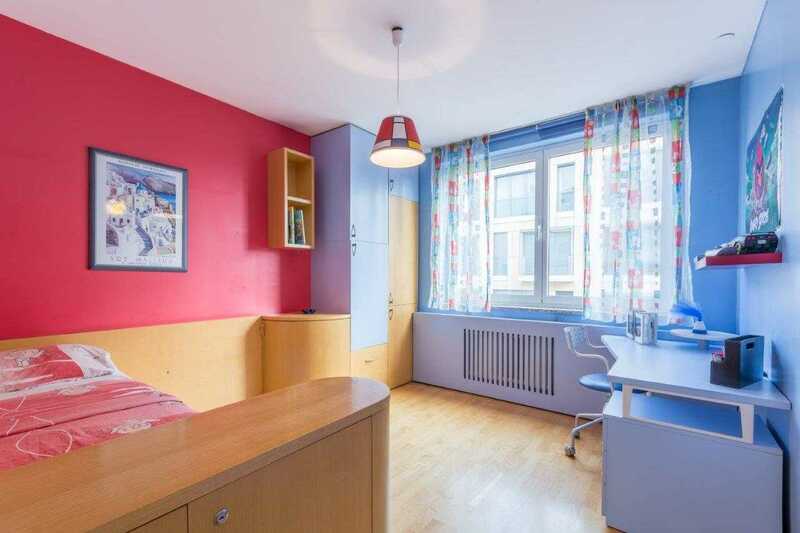 Whatever time of year you are planning to come, book this apartment early to avoid disappointment. 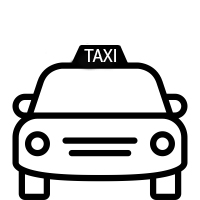 For additional person please add 20 euros per night. Children under 7 stay free of charge. 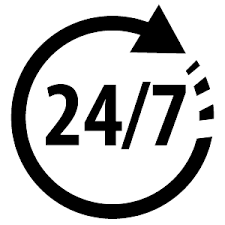 For each additional person over 7, please add 40 euros per night. Children under 7 stay free of charge. If you want to book Penthouse Apartment or need additional information, please send our Santa a note. She will reply without delay. 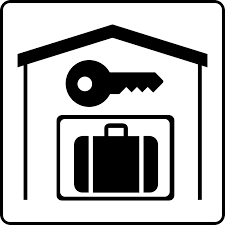 If Penthouse Apartment is not available, we will do our best to find and recommend to you a comparable apartment in Ljubljana city center. 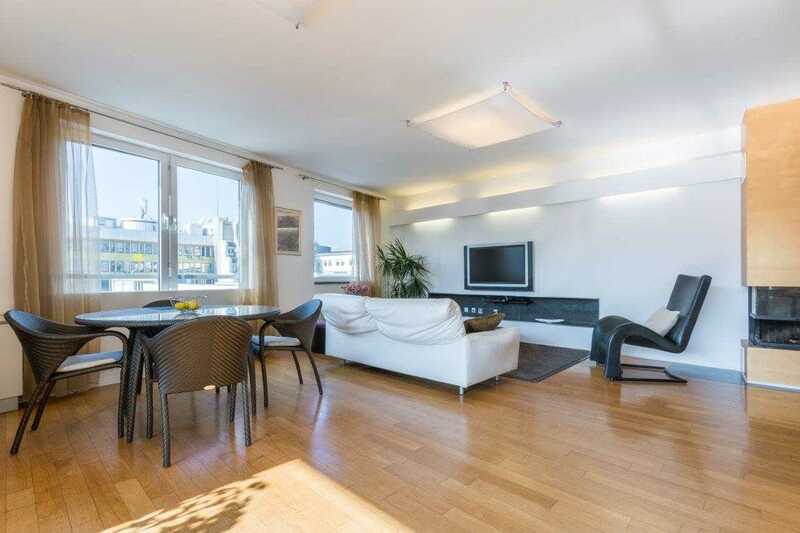 Check out this fine FLA apartment: Luxury Penthouse Apartment Ljubljana – Apartments for Rent in Ljubljana.